Major cost overruns on any construction project are frequently due to poor forecasting of the costs and inherent risks in a contract at tender stage. And this in turn means that poor construction estimating can impact the economic feasibility of any proposed construction project. That is why construction estimating is considered to be one of the most important of all of the practical aspects of construction management. There are many, sometimes complex issues to consider when estimating the cost of a construction project and there are a number of key elements that come into play with each of these issues which can dramatically shape the entire estimating equation. Over-estimating may result in your client quite literally getting the shock of their life when it actually comes to the tender process and in extreme cases the project actually being abandoned. On the flipside under-estimating may have dire consequences for you as the Estimator and in the long run severely hamper your confidence as well as your reputation. When companies are reliant on the tender process to acquire their work, tendering with confidence in the outcome is vital – so learning how to estimate accurately and consistently is a must! Construction estimating is not simply number crunching to get a figure. But it is a multi-faceted process that must be followed in order to ensure that all risks are accounted for. This multi-CPD-accredited Construction Estimating training course will look at the very latest principles, practices and techniques for accurately estimating construction project costs regardless of any changes in the cost of materials, equipment or labour. Using proven case studies, all the procedures that are involved in the compiling of a viable estimate for construction projects are covered in detail, and you will leave this training course with the understanding of how to prepare an accurate estimate for typical construction projects. 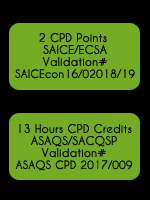 Plus Each Course Participant will receive access at the training to Take-Home Estimating Templates worth over R1000 ABSOLUTELY FREE!